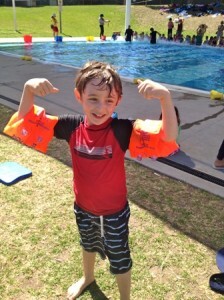 This week my nephew Reuben faced his fears and had swimming lessons. We all cheered and glowed with pride. Apart from the glorious personal triumph, there is nothing that unusual about Reuben’s moment in the pool. Cast your mind back to when you were a kid and think about all the times you were scared to do something and then did it. For me, it was pretty much all the time. Sometimes it was a niggling feeling (a sleepover at a friend’s place); sometimes it was outright terror (a sleepover in the haunted Girl Guides hall). I wasn’t an especially fearful kid but there are a lot of things to be fearful of when you’ve only accumulated six years of experience in life. First day of school is scary, needles are scary, and the first time you get picked in a sports team is scary. Heck, each sports day at school presented me with a fresh horror. I get nervous just thinking about all of that pressure. If I had to face that much pressure every day at work I would seriously consider changing jobs. As a kid, I just did it. That’s what kids do and it’s what grown-ups expect of them. Then we grow up and we become our own bosses. All of a sudden we don’t have to do the stuff we don’t want to do anymore. Some of us take that to mean that we don’t have to do anything scary anymore. Indeed, some of us think a life well lived is a life free of fear. I disagree – a life well lived is a life in which you face your fears all the time until courage becomes your strongest muscle and life’s challenges are just as hard as they ever were but you’re ready to take them on. Imagine what your childhood would have been like if you never had to do anything scary. What would you have missed? All the learning and growing that wouldn’t have happened. Now apply that to your grown up life. What learning and growing are you missing right now because you stayed home instead of going out, decided not to apply for that job, put off travelling for another year? Reuben was especially brave in the face of fear and we were especially proud and cheered him on. As a grown-up it would be impractical and weird to have your mum and dad standing at the sidelines cheering you on every time you did something scary. So be your own cheer squad. Recognise the moments when you’d rather call in sick than deliver a speech. Then, when you don’t call in sick, give yourself credit for your bravery. Maybe even buy yourself an ice-cream. Pingback: Reuben is awesome (an extra special tip) | Where is Sarah? This entry was posted in Culture and tagged 99 tips for a better world, courage. Bookmark the permalink.